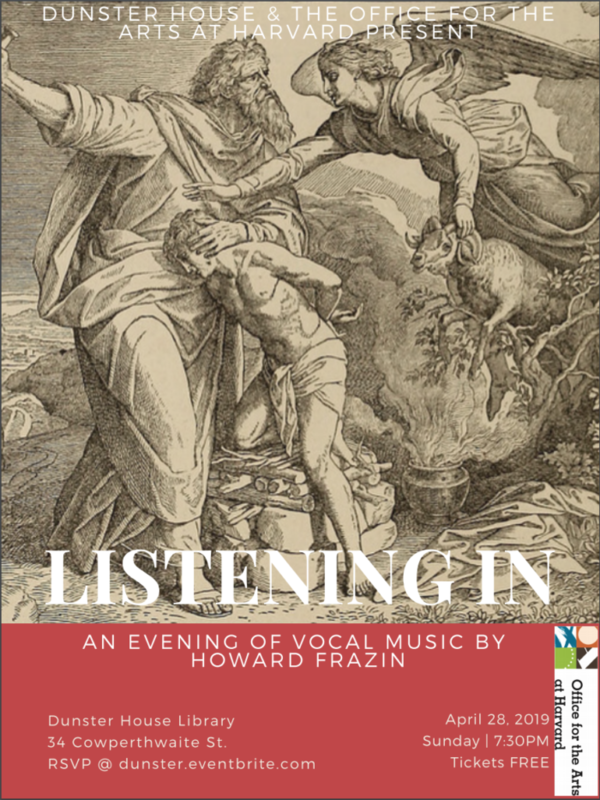 Please join Dunster House and the Office for the Arts at Harvard for an unforgettable evening of music by local composer Howard Frazin, held in one of Harvard’s most prized venues—the Dunster House Library. Sunday’s concert will showcase an all-star lineup of professional musicians performing, among other works, Mr. Frazin’s song cycle, Letting Go, the text of which was written by the late U.S. Poet Laureate and Harvard alum Donald Hall, as well as Mr. Frazin’s riveting work, The Voice of Isaac—an oratorio retelling the story of Abraham and Isaac from Isaac’s perspective—that was premiered at Boston’s Jordan Hall in 2003 and later performed in Sander’s Theatre. It is sure to be an evening you won’t want to miss! Tickets are available to the entire Harvard Community but seating is extremely limited and must be reserved in advance in order attend.